Readers will enjoy reading Robert and David Weintraub’s Ed Week “letter to Arne Duncan” on poverty and test scores. It’s a well-written, concise and timely piece. (Educaton Week, January 8m 29014, pp 2012, “Why Arnie Duncan’s PISA Comments Miss the Mark“. A Brief History of Reform! It’s been a while since I’ve written in this space. But I’m mending my ways. What set me off? My granddaughter just came across something interesting—and not new. In 2001 PBS put together a video called School: The History of American Public Education. In connection with the film they listed ten significant individuals who had an impact on American public education. And I was one of the ten! It’s an interesting list. It starts with some obvious names: Horace Mann and John Dewey and Booker T. Washington. . And then adds a number of individuals who I didn’t recognize at first. John Joseph Hughes who, as Archbishop of NYC, initiated the widespread development of parochial Catholic schools in the late 19th century; Catherine Beecher who pioneered schooling for women; Ellwood Cubberley who a century ago promoted scientific management of schools; Albert Shanker whose life personified the growth and influence of teacher unionization; Linda Brown Thompson—the Brown of “Brown vs Board of Education”; Jose Angel Gutierrez who as a Texas community organizer led the movement for bilingual education. The final two are E.D. Hirsch, Jr who pioneered the idea of a “common core” curriculum (which is now embodied in DOE policy in 48 states), and me–Deborah Meier! The description of my work suggests that I made an impact by demonstrating how small democratic public schools could successfully educate low-income Black and Latino kids. What’s interesting is precisely how varied the list of “reformers” is—representing contradictory developments that still have an impact on American public schools. It helps see how the back and forth of our history was responding to changes in society itself and how many different viewpoints have influenced schooling, reflecting its specific time and circumstances. Interesting, the two most recent individual innovators (Hirsh and I) both champion very different approaches, but both do so in the name of furthering democratic ideals. Hirsh focuses on a “common” curriculum as the route to a better society, and has offered his detailed K-12 approach which, with some variations, has recently been embedded in national policy. I have focused on the school itself as a community, one that teaches democracy as an institution. Both pedagogy and curriculum are shaped democratically, teaching in the process what it means to be a member, a citizen. Thus, as Dewey posed it, it’s a form of associated living, which builds on the mutually respectful relationships between family, school staff, students and community. While agreeing on a few broad principles that unite us as a people, I’ve argued on behalf of schools delegating the endless array of decisions that must be made amongst its members. Some would adopt Hirsch’s curriculum, some would have detailed grade by grade mandates, some would make more use of technology than others, some would leave most pedagogical and curricular decisions to its faculty, etc. But accountability would rest, as it does in a democracy, on the work of its leadership, which would—except for issues dealing with civil rights and health and safety—be responsive to those it serves. What was only two decades ago the primary “reform” movement is now hanging on tenaciously, but has far less support in places of power. The new reformers have borrowed from Cubberly, remind us of the struggle over mass public education in the first half of the 20th century. This was a period in which corporate practices—the assembly line ideal—had a serious influence, and labor unions were largely taboo in public service, including teaching. Pay-by-performance goes back to this period, along with many other new ideas coming from the new reformers led largely by powerful and often wealthy non-educators, think-tanks and corporate Foundations. In this context I welcome the new mayor of NYC’s appointment of an educator—Carmen Farina as our new Chancellor. She’s a first in a long time—following four people who made their reputation in business, Wall Street , or political life. DeBlasio’s campaign promises—which included pre-school education and considerable skepticism about the role of testing and charter schools—is encouraging. Who knows who, a century from now, will be considered representative of the late 20th and early 2lst century. That story is yet to be written. But, of course, I’m cheering “my side”—which does not mean schools just like “ours”, but schools in which the “public” in the form of real-live school-based adults have a serious and respected role in most important decisions, and when what’s good-enough for the children of the rich won’t be viewed as “beyond the reach” (fiscally or intellectually) of all citizens. What is Wrong with Vouchers? This is the latest blog of my son, Nicholas. The rhetoric behind vouchers is that if everyone had vouchers parents could select the best school for their child instead of being forced to go to “government” schools*. Where does such logic fall apart? There are two main logistical reasons it is really a false promise. One is economic and the other is question of who gets to choose. There’s always at least one superbly interesting article in Commonweal magazine. This week it’s a book review written by David Kennedy of Stanford University. The book, Breach of Trust, is by Andrew Bacevich, The book’s subtitle: How Americans Failed Their Soldiers and Their Country, is accurate but also misleading.. This same mood or logic seems to carry over to one after another “civic” duties—like preserving and enhancing public education, public hospitals, public prisons, and more. I heard a story last night from my brother about the struggle over NYC’s parks. He reminded me that NYC does not any longer truly have “public parks”—as they once did. More and more are dependent on private charity. The result includes a great gap in support for Manhattan parks vs. borough parks. (It includes waning maintenance for large federal and state parks, intended to be kept close to its natural state.) I distantly even remember when admission to our museums and zoos were free. We have turned our “commons” over to the rich to protect and nurture—as they see fit. Sometimes it relates to their financial interests (which do not necessarily coincide with the country’s interests) and, other times to clean up their family name (like Carnegie, et al a century ago), sometimes to help a friend, sometimes because it brings status to them from their social and business circles. And its generosity that replaces much of their duty to pay taxes, which requires more fancy political footwork to control. The rich are not demons, they are simply unmoored from loyalty to the rest of us. Their experience suggests to them that what helps them is good for everyone (or, as Petrelli suggests in his blog with me on Bridging Differences—they don’t deserve it). 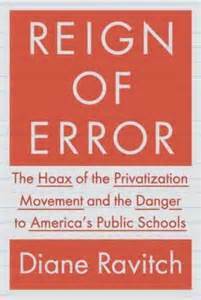 Definitely go out and buy Reign of Error: The Hoax of the Privatization Movement and the Danger to Americas Public Schools by Diane Ravitch, which just been launched with proper publicity. She is a phenomenal woman—sending out a half-dozen e-mails a day, two books in the last decade, and traveling to speak throughout the USA. And….while she’s younger than me, she’s old enough to have rested on her laurels. Maybe it helps to change your mind, because my exhaustion comes (in part) from feeling it’s all been said before (including by me). The trouble is that crying “wolf” has never been a great way to make sensible policy. Sometimes there is no choice (like Pearl Harbor). But the continuous claims that our public education system is destroying our nation has almost entirely led to bad policy. Then lo and behold: no one has pulled it all together better than Diane—over and over again in the past few years she has led the challenge to the corporate reformers—right , center and left.. Her last two books Reign of Error and The Death and Life of the Great American School System (2010) pull it altogether. In Reign of Error she spends the first 20 chapters laying out the case, and the last 13 offering some obvious and do-able responses to the oft-heard, “but what else can we do?” She’s more supportive of the “way things were” than many other educators (like me) have been, relying subliminally perhaps on the fact that if we eliminate the scores of children in poverty on international tests, the USA does quite well. Yes, Massachusetts scores put it number one in the world, or close, if it were a nation (like Singapore?) rather than a mere state of the union. But I think neither of us is truly satisfied with what has passed for a good education in its highly regarded school districts, much less the districts that served the least advantaged schools. She also overestimates, in my view, the degree to which Americans ever attended “common schools” That’s another story which all this crisis talk leaves untouched—or actually exacerbates as she ably documents, and where the promising fledgling progressive reforms of the 60s through 80s had focused attention on. As my mentor, and author of a study of American high schools, Ted Sizer said, “using one’s mind well” is the essential unexplored task facing the high schools for democracy. We have barely skimmed the surface of making either our schools or our democracy “belong” to everyone. NBC News will be presenting, for the fourth time, several days of programming focused on education. Education Nation will take to the airwaves from October 6 to 8, broadcasting from the New York Public Library. “Education Nation” seeks to create a thoughtful, well-informed dialogue with policymakers, thought-leaders, educators, parents and the public, in pursuit of the shared goal of providing every American with an opportunity to achieve the best education in the world. These discussions cover the challenges, potential solutions and innovations spanning the education landscape. I was recently perusing the CPESS (Central Park East Secondary School) alumni Facebook page of students that graduated between 1991-97, looking over their words and photos… and they still like to get together! There were photos of them all there together in Brooklyn. ( Sadly I could’t make it.) Drinking, laughing, hugging, in serious conversation and in hilarious ones. I then looked at all their individual photos—and remembered each of them! Maybe that should be the measure of a good school?